Say hello to your new subscribers and engage them right then and there. 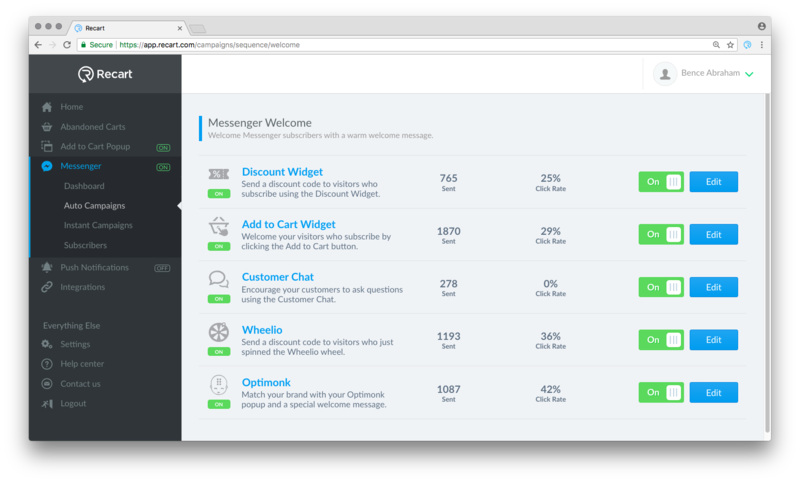 Send discount codes and set up auto messages for Customer Chat. Everyone likes a warm welcome, and engaging your new subscribers is especially important for your Facebook Messenger Campaigns. For that reason, we added an easy way for you to say hello to your new subscribers, and start a conversation with them immediately. You can also use the Welcome Campaigns to send them discount codes or set up an automated welcome message for Customer Chat. To enable Messenger Welcome Campaigns, please visit your Recart Dashboard and go to Messenger Auto Campaigns ➜ Welcome Campaigns. You can enable and edit the individual campaigns to make sure that your Messenger Welcome Campaigns are set up just the way you want them. I recommend enabling them for all features you're using and editing the templates to make sure that your customers feel delighted by your welcome messages. Welcome Campaigns will give you several benefits and help you maximize the potential in all your Facebook Messenger Campaigns. First of all, Messenger Welcome Campaigns will improve the customer experience. When signing up to your Facebook Messenger Campaigns, they will receive an introductory message to let them know about the subscription. This will help avoid unintentional subscriptions that might lead to complaints or unhappy customers. 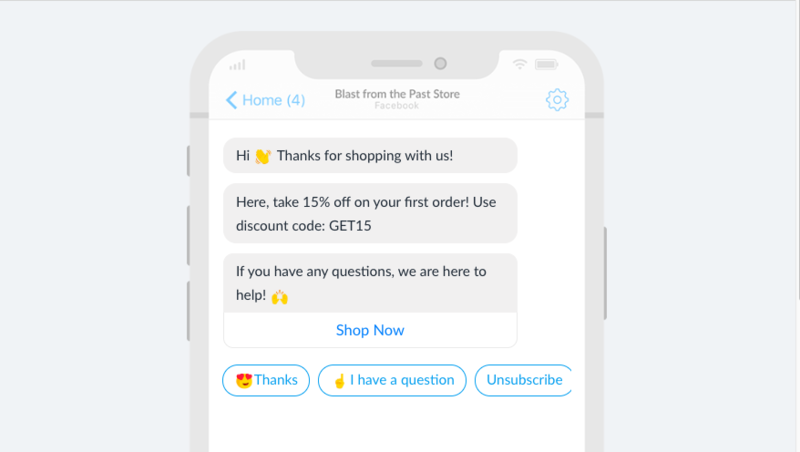 This way, you can ensure that your customers are aware of their subscription and they will be prepared to receive marketing messages from your store via Facebook Messenger. Messenger Welcome Campaigns will also help you engage your new subscribers right when they subscribe which is essential for effective marketing campaigns and will help you identify new subscribers. Make sure to add quick replies to your Messenger Welcome Campaigns. You want to receive as many replies form the Welcome Campaigns as possible. Instant Messenger Campaigns can only be sent to subscribers who have replied to one of your Facebook messages, and the Welcome Campaign is the best time to get them to reply and add them to your Instant Messenger Campaign audience. You can also use Messenger Welcome Campaigns to add a quick introductory greeting to new conversations started using the Customer Chat. Use this message to let your customers know when they should expect a response from your team. All in all, Messenger Welcome Campaigns are an easy way to improve the experience of your customers, increase engagement on your Facebook Marketing Campaigns and grow your Instant Messenger Campaign Audience.